When we truly care about climate change and all the creatures that walk, fly, swim, and slither along with us, then the most important thing each and every one of us can do is to reduce our consumption and be mindful of the footprint we leave behind. We should try to consume only what we need, not what we merely desire. Every product that comes from a factory (smartphone, car, clothing, etc.) requires thousands of other factories, millions upon millions of gallons of water, untold amounts of plastic and waste, on and on. And all of those things require the deaths of countless living creatures— many of them sentient, like us. You could almost think about every product having two prices: the monetary cost and the life cost. And you know what they say: “Nothing’s free.” That’s the bad news. The good news is that every single one of us has a “super-power”: to “alt-consume”. The less we consume (and the more we consume in less harmful ways), the less need there will be to produce things. As production decreases, habitat destruction, poisoning of water and oceans, and more all decrease as well. Plus, we save money, so when we do consume, we can buy higher quality products that do less harm and last longer. We may not be able to completely stop climate change and extinctions at this time, but surely we can and should do everything we can to slow down the process as much as possible. The very good news is that making change like this is entirely within each of our own control. We don’t have to convince CEOs or Presidents to change their policies (though that would be great!). We can start the change right now. Of course many people are doing just that: taking action in their own lives to do the least amount of harm possible. Which is fantastic — and I admire and respect them greatly. To make the most of our individual actions, we need to act with intention and purpose. We need to plan out how we will live in the world. We need reminders and tools. And we need to know that we are part of something bigger, much bigger. That's where fabe comes in. 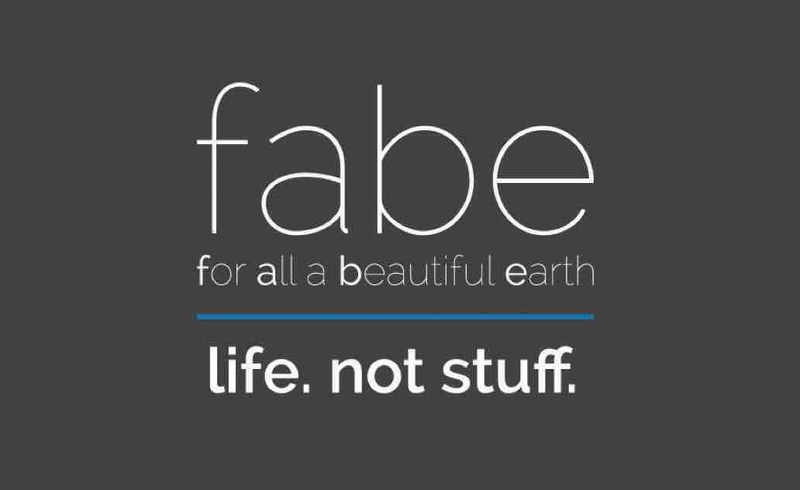 fabe is an app that simultaneously helps you reduce consumption and joins your efforts to a worldwide movement of millions of people with the same green and sustainable goals. Visit forallabeautiful.earth for more information about the app and our project. fabe is the brainchild of Steven Feuerstein , who has been busy writing and teaching software, studying evolution, and trying to figure out how he can help stop human-caused extinctions. He is joined by Vincent Morneau, a software developer with a passion for off-the-grid living. We humans need to change our ways. We need our governments to set policies that reduce pollution and increase green spaces. We need corporations to follow sustainable practices. But each of us also need to change the way we live our lives so as to do the least harm. fabe can play a big and important role in making this happen. We hope you will contribute to our campaign so that we can build fabe as quickly as possible and get it into the hands of millions of people who want to - and will - make a difference.